Christmas is the most popular religious and cultural celebration for the birth of Jesus Christ on 25th December among billions of people around the world. People celebrate it with family and friends gathering at one place, giving gifts to each other, Santa costumes, decorating the house with lights etc. One of the important areas for decoration is the “Chandelier”. Decorating a chandelier can totally change the appearance of the room and can gain attention of your friends and family. There are several ways to decorate your chandelier. One way to design your chandelier is to use a ribbon. Ribbons can be a real attention gainer and can change completely change the appearance of the chandelier. There are different kinds of ribbons you can use depending on the size of the chandelier, the design and theme of the room, whether the chandelier is tradition or modern etc. For chandelier that is big in size, one single big ribbon in the center would be good enough whereas for small chandeliers, small ribbon strips can be used to wrap around the chandelier. However, selection can vary according to the preferences of the people. 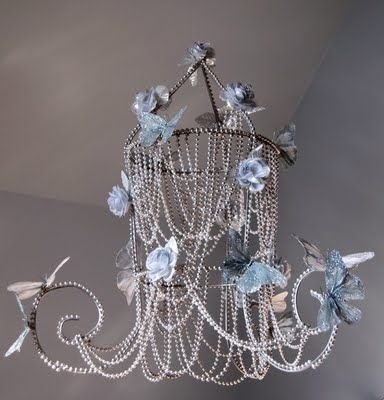 Another addition to beautify the chandelier is to use Faux spray beads and flakes. These are available in different designs, patterns, sizes, colors and shapes. Depending on the color of the chandelier, various faux sprays can be used and can be added along the lines of the chandelier with the help of a wire to keep the faux sprays attached. The most commonly used colors are silver and red for faux sprays on Christmas occasions. However, depending on your chandelier’s color and theme, you can select a faux spray that matches your style and preference. Another addition to make the chandelier more appealing can be to use different ornaments. Ideally, one big crystal ornament should be used in the center of the chandelier and smaller ornaments can be used at all different edges of chandelier. Ornaments and various jewel items can make your chandelier sparkle and stand out from the rest of the furniture in the room. Ornaments and jewels normally used with a chandelier are much fancier and shinier from the rest of the accessories used for the décor of the chandelier. Metallic Silver Squares: This is like a mini version of a chandelier made up of metallic crystal square pieces usually silver in color and very bright and shiny. 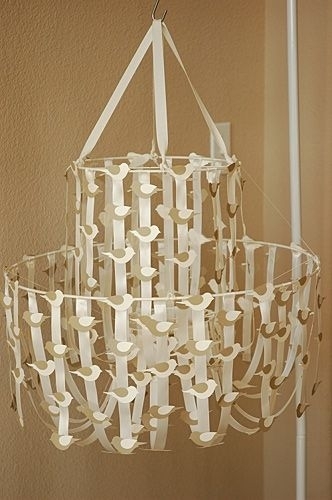 This can be attached with a chandelier to bring more lift into the chandelier and give it a much vibrant appearance. Christmas Ball Ornament: Christmas balls are the most popular and commonly used ornament on Christmas trees and chandeliers as well. These are shiny large multi-colored balls which can be hanged from the chandelier to improve its look. Glass / Prism Ornaments: Glass or prism ornaments are the expensive ornaments you can use for your chandelier. However, at the same time they are the ones that give the chandelier a royal and elegant look. Beaded Chains: Beaded chains can also be used to hang from the chandelier at different edges to make the chandelier fancier. Glitter Ornaments: Ornaments with glitter on it can also be used depending on the preference of the person and the theme of the room and style of the chandelier. Silver and Gold Hooks: Hooks are also an option which can be considered for the purpose of hanging items on chandelier. They can be either in silver or gold, can be of different colors and shapes and sizes as well. Jingle Bell Ornaments: Jingle bell shaped crystal ornaments can also be used and are quite popular on the occasion of Christmas. One of the most important factors in appearance of the chandelier are the lights. Usually bright lights are used for chandelier in order for them to stand out and be more attractive. Furthermore, there are options to control the lighting level in chandeliers so light can either be increased or decreased depending on the mood of the people and environment. Moreover, different kinds of bulbs are also available for chandelier such as LED bulbs, halogen bulbs which have different benefits such as longer product life, less electricity consumption, brighter light etc. Bulbs can also be changed accordingly depending on the type of light that is preferred by a person. Different bulbs of different color lighting can also be used in one chandelier. It all depends on the choice and the creativity of the person decorating the chandelier. The top 4 decor materials in chandelier décor for the Christmas occassion are ribbons, faux sprays beads and flakes, ornaments and jewels and lighting. However, depending on the creativity of a person, the option for decoration could be infinite. 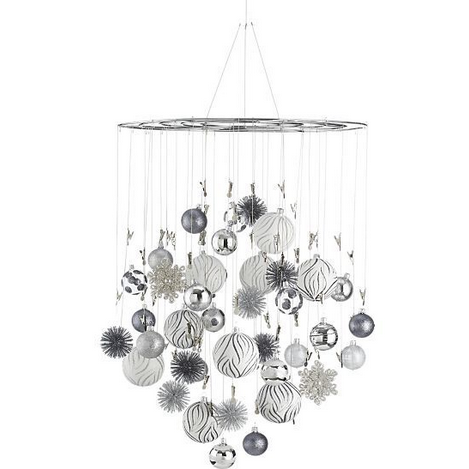 What's your chandelier decor idea for this christmas?